Both India and Pakistan have joined the Shanghai Cooperation Organisation, a security-oriented institution, despite their bilateral rivalry. 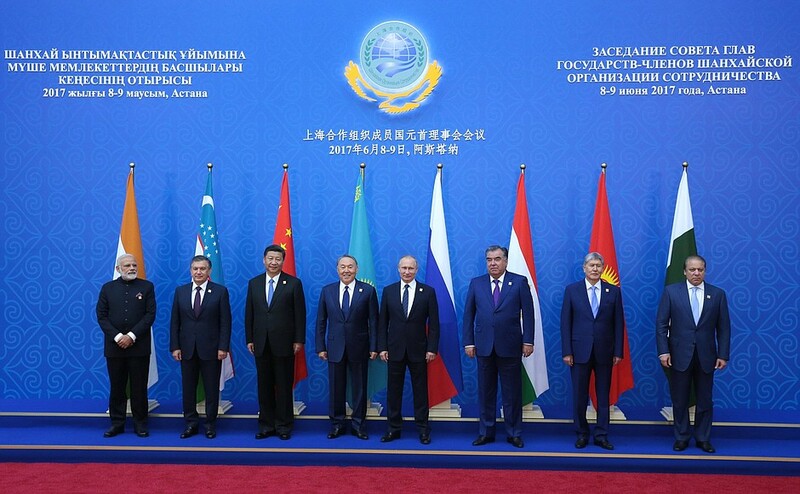 The Shanghai Cooperation Organisation (SCO) took a bold step at its June 8 summit by admitting both India and Pakistan as new members. The SCO’s traditional mandate has been to enhance security cooperation between its members, and so the simultaneous addition of India and Pakistan—two countries with intractable mutual security issues—has left many observers puzzled. But the decision makes sense within the context of the relationship between the SCO’s two foundation powers, Russia and China. The SCO was formed in 2001 with an initial focus on resolving border disputes. This expanded to a broader security mandate of combating the ‘three evils’ of terrorism, separatism, and extremism. However, coordination has been limited by the often-incongruent interests of the initial six members—China, Russia, Kazakhstan, Kyrgyzstan, Tajikistan and Uzbekistan—and their aversion to devolving power to a regional body. 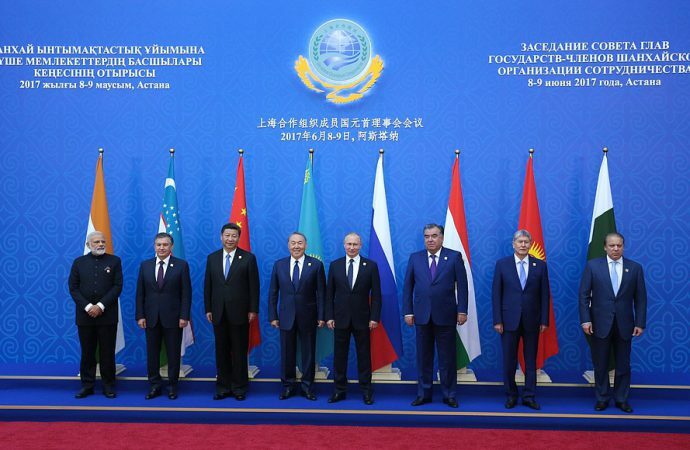 Considering this inertia, the SCO has focused on economic cooperation in recent years. The organisation’s 2015 development strategy was a prime example of this. Its extensive list of objectives included “developing common approaches to the Silk Road Economic Belt Initiative”. In line with this, both Chinese and Russian officials have expressed support for linking the Belt and Road Initiative (BRI) with the Russian-led Eurasian Economic Union (EEU), though there have been few tangible examples of this materialising. The China-Pakistan Economic Corridor (CPEC) is one of the most important facets of BRI. The corridor stretches 3000km from Kashgar in western China down to Gwadar on Pakistan’s coast. Once completed, it will give China access to the Strait of Hormuz at the mouth of the Persian Gulf. 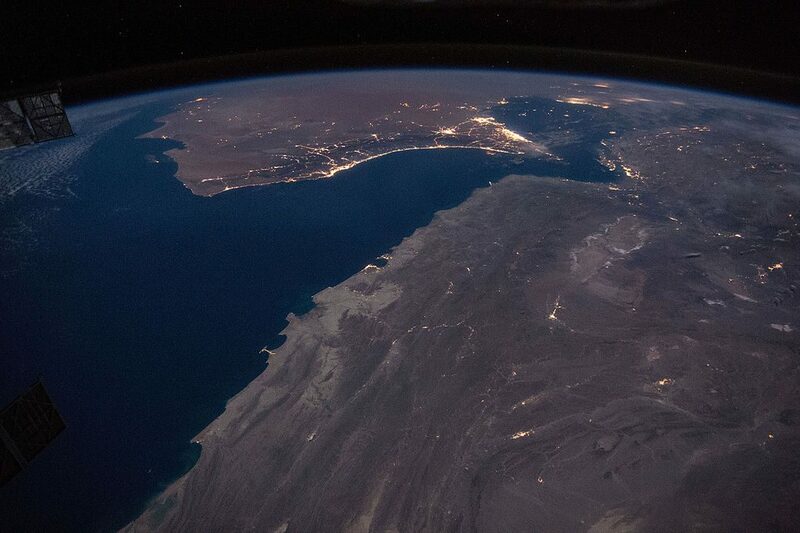 This will be a huge strategic boon for Beijing as the Strait of Hormuz accounts for the largest share of the global maritime oil trade of any maritime transit route. Gaining access will enable China to mitigate its reliance on the Malacca Straits between Indonesia and Singapore for its energy security and maritime commerce. The successful completion of CPEC—which cuts through Gilgit-Baltistan, a part of Kashmir administered by Pakistan but claimed by India—will see Indian clout in Kashmir marginalised in the face of an increasingly united Pakistani-Chinese bloc. Considering that China also has territorial disputes with India in Kashmir, Chinese motivations for including Pakistan in the SCO are manifest. While Russia has previously hindered efforts at economic cooperation among the bloc’s members, the SCO now provides an ideal avenue for Moscow to cultivate new markets in the face of Western sanctions. Indeed, President Putin has been clear in his plans to push for further integration between Russia’s EEU and BRI. SCO members have typically pursued their individual, often conflicting, interests uninhibited by any compellence from the organisation to toe the line. India and Pakistan’s accession to the bloc will likely further complicate the SCO’s consensus-based modus operandi. In the high likelihood that Islamabad and New Delhi import their frictions into the organisation, the absence of a robust secretariat may well see Moscow and Beijing choose sides. If the past month is any indicator, then the norm going forward will see bilateral security partnerships used by the SCO’s main powers—India, China, and Russia—to hedge against each other. On June 7, Russia and China signed a ‘roadmap’ on military cooperation. Just over two weeks later, Russia signed a similar roadmap with India against the backdrop of the China-Bhutan-India standoff in the Doklam region. Similarly, on June 15, the Pakistani chairman of the Joint Chiefs of Staff Committee met with the chief of the Joint Staff Department of China’s Central Military Commission to deepen their bilateral military relationship. THE INDIA-RUSSIA BILATERAL: BALANCING AGAINST CHINA? 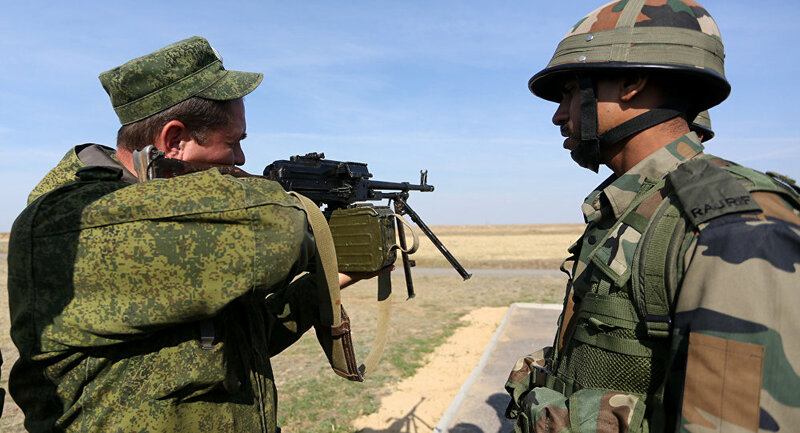 Moscow and New Delhi’s military ties date back to the Cold War and almost 70 per cent of India’s military hardware comes from Russia. The two are currently engaged in multiple joint construction projects ranging from fighter aircraft to nuclear reactors. Additionally, both nations participate in the biannual Indra military exercise, which for the first time this year notably featured personnel from all three service branches of both nations. Pre-existing ties and the ‘Special and Privileged Strategic Partnership’ that exists between Russia and India provide the ideal foundation to further their shared interest in balancing China’s growing clout in the region. From Moscow’s perspective, welcoming India into the SCO dilutes Chinese influence in the group. While Putin has voiced his desire for integrating EEU and BRI, this has been inspired in no small part by the recent frailties in the Russian economy. Moscow’s historical anxieties that the SCO, and now BRI, could lead to Chinese dominance in Central Asia likely outweigh a desire to go all in with the potentially lucrative BRI. Similarly, from the perspective of New Delhi, gaining membership provides India with a louder voice to potentially complicate China’s ambitions. THE CHINA-PAKISTAN BILATERAL: BALANCING AGAINST INDIA? Islamabad and Beijing’s bilateral security relationship is similarly robust and well-established. Both nations regularly participate in joint military drills, such as the 2017 AMAN naval exercise, and have growing defence industry partnerships. The Pakistan Aeronautical Complex and the Chengdu Aerospace Corporation have engaged extensively in joint projects and the China Shipbuilding Trading Company and Karachi Shipyard & Engineering Works have done similar work. The China Precision Machinery Import-Export Corporation has also allegedly provided transporter erector launchers for Pakistan’s ballistic missile program. When pitted against the backdrop of India’s growing strategic clout and China’s increasing entanglement in Pakistan’s affairs through CPEC, these ties may prompt Islamabad to seek assistance from Beijing with the Kashmir dispute. The SCO is adopting an increasingly bipolar character. The economic lure of the BRI is an avenue in which the organisation’s members—minus India, which has rejected the invitation to join BRI—will share common interest and look to capitalise on pre-existing SCO frameworks. However, in terms of security cooperation, traditional animosities and contemporary anxieties mean the bloc’s powers are likely to hedge against one another. The Sino-Russian relationship will be the most dynamic factor in this equation. While Beijing and Moscow have found increasingly more common ground in recent times—countering US hegemony, colossal energy deals, an abhorrence of grassroots democratic movements, and two unrivaled national leaders—the relationship is a partnership of convenience. Both sides will have no qualms in looking for opportunities to contain the other’s level of regional influence. The SCO may well be turning into the prime vehicle through which this will occur.